Be prepared for customer and supplier conversations with the latest views of industrial trends, political developments and emerging risks. Get timely, data-driven insights into major developments in trade-related politics and regulations. Keep track of shifting trends in industries adjacent to yours. Leverage our ideas generation with event-driven, transparent, fact-based analysis. Discover how trade data can be applied to real world research problems. Whatever your do, you rely on logistics. Access analysis of the competitive dynamics and corporate finances of the shipping companies, as well as the impact of port activity and shipping rates on your business. Container handling through most U.S. seaports has been flattered in the past six months by the clearance of empty containers resulting from an earlier surge in traffic from China. The 10 largest seaports handling 10.95 million TEUs of empty containers in 2018. The normal seasonal decline from September through April has yet to emerge, with 4Q handling up 54.8% year over year followed by a 16.5% rise in 1Q. As handling patterns normalize the ports which are most likely to see a rapid drop in handling of empty containers are Seattle / Tacoma – whose volumes jumped 47.7% year over year in March – followed by Houston and Los Angeles. Panjiva Research, shown above, is available by reaching a Panjiva account executive. Learn what trade data can tell you about industries from commodities and food to electronics and autos with concise, regular updates. Coffee prices have collapsed 23.9% from their October peak as a result of a surge of supplies globally. While global export growth only increased by 2.8% year over year in February that followed a 16.3% rise in the prior three months. 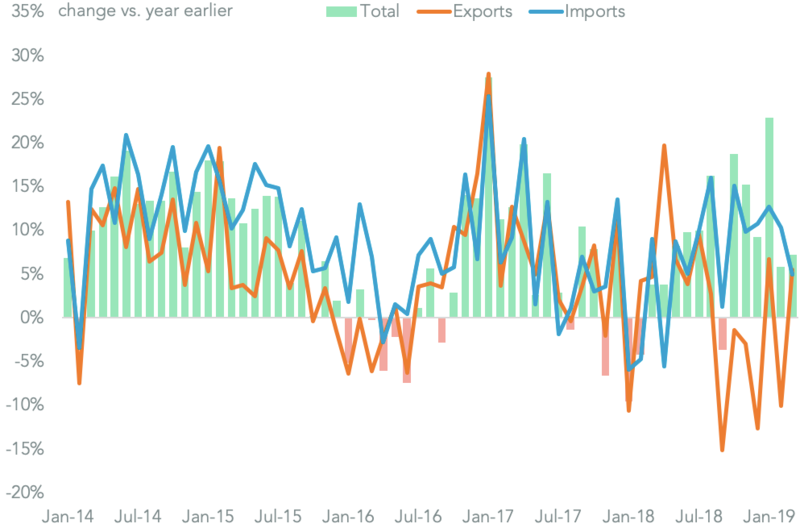 Exports from Brazil were the main driver with an increase of 36.4% compared to a year earlier in February. Shipments to the U.S. from Brazil climbed climbed 53.3% year over year, including a 95.3% jump in purchases by JM Smucker’s Folger brand. By contrast, Starbucks’ U.S. operations purchases of Brazilian coffee fell 10.3% in February, possibly indicating the excess Brazilian grades do not fit with its supply chain preferences. Get the story behind the story with in-depth analysis of what is driving trade in the world’s largest economies. Panalpina reported 5.0% year over year revenue growth in 1Q 2019, marking the slowest expansion by the freight forwarder since 1Q 2017. That’s largely been down to a 3.0% drop in ocean freight volumes due to a weak macroeconomic situation, according to CEO Stefan Karlen. The firm may have tried to offset the weaker market by competing for market share. 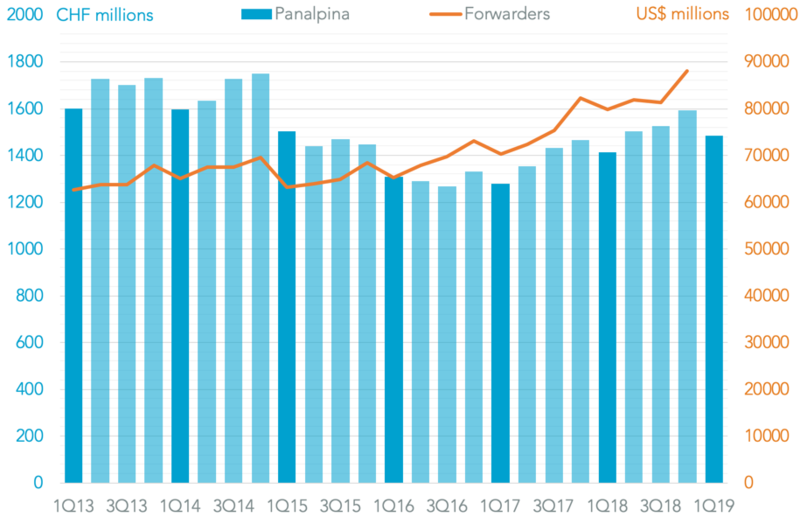 Panalpina’s U.S. seaborne inbound shipments climbed 4.7% year over year as the result of a 31.1% surge in shipments from China in 1Q 2019. The firm’s prospects are a function of the ongoing takeover by DSV, where scale – both via acquisition and organic growth – looks to be a key strategic objective. Shifting policies, regulations and trade deals move the goal posts - get the data and facts behind the hype. The WTO has ruled that China has incorrectly applied tariff-rate quotas on imports of corn, rice and wheat in a case brought by the U.S. 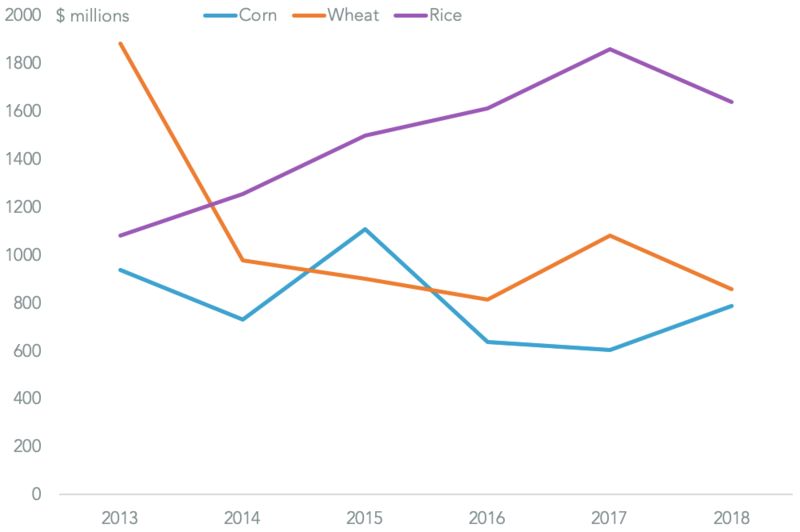 The Chinese government may correct that as part of the forthcoming purchasing commitments set to be made to the U.S. China imported $3.29 billion of the three grains in 2018. 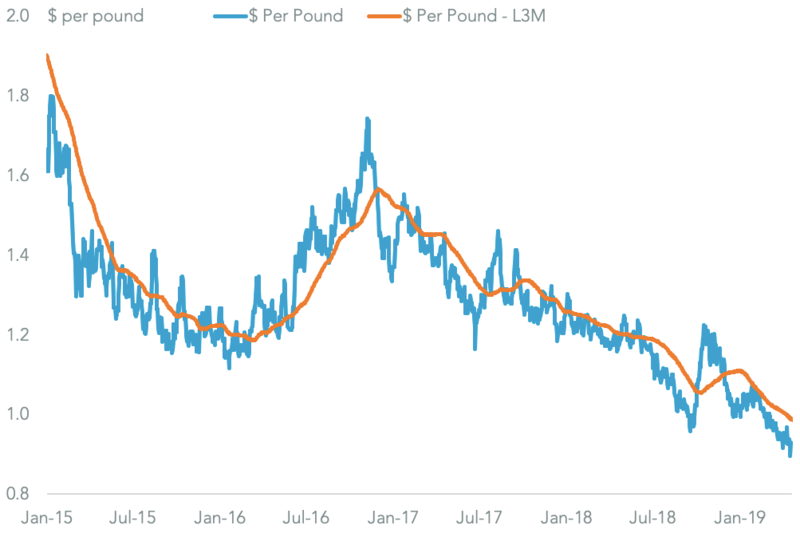 U.S. exports’ share of that meanwhile amounted to just $133 million in the 12 months to Feb. 28 and have been zero since July as a result of tariffs. Total U.S. exports of the three reached $19.6 billion, though shipments of wheat and rice have fallen 3.8% year over year. Increased sales to China, which could reach $2.24 billion based on 2014’s peak deliveries, would therefore held U.S. farmers as well as grain shippers including Archer Daniel Midlands and Scoular.